Seven full-time staff run OBWB programs that serve 13 municipalities, three regional districts and four First Nations communities in the Okanagan Basin. We serve the diverse interests of residents, governments, businesses, non-profit organizations, and visitors in all aspects of water use in the Okanagan. Anna Warwick Sears PhD; is responsible for the day to day operations of the Okanagan Basin Water Board including the collaborative water management initiative, water quality improvement programs and aquatic weed management. Anna has a background in population biology and watershed planning, and was previously the Research Director for an environmental organization in Sonoma County, CA. In her free time, Anna likes to cook exotic food and go berry picking. Nelson Jatel CLGM, BSc, MA; works with the Okanagan Water Stewardship Council to develop practical solutions that reflect the best available science, innovative policy and consensus approaches. 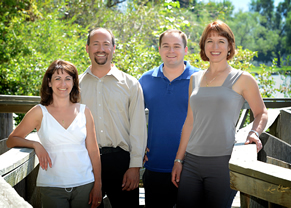 Nelson has a background in freshwater science and was previously the Executive Director of the Okanagan Partnership. In his spare time, Nelson enjoys local food, wine, outdoor sports and spending time at his family’s vineyard in Naramata. James Littley, CD, MA; is the organizational Centre of the office, responsible for the smooth and efficient operations of the OBWB’s programs. James administrates the board’s two grant programs, – for wastewater infrastructure, and water conservation and quality improvement. He has extensive management experience through more than 12 years’ as an Officer in the Canadian Forces Reserves. He earned a B.A. with a double-major in Political Science and Human Geography from UBC Okanagan in 2012, and a Master of Arts focussed on Local Government Sustainability Planning from UBC Okanagan in 2018. James also currently serves as a board director for the Canadian Environmental Grantmakers Network. James enjoys being outdoors, kayaking and travelling with his family. Corinne Jackson, B.A. ; is responsible for getting the word out about Okanagan water issues and the activities of the OBWB, and is the staff lead on the Okanagan WaterWise communication strategy. Corinne is uniquely suited for this role – with an education in political science, and work experience as an award-winning journalist, having covered numerous beats, including social justice issues. Corinne left journalism in 2001 to pursue a career in communications while continuing to feed her passion for social issues. In her off-hours, she loves to catch up on the news and all things political, play and explore with her two kids and husband, and hone her xeriscape gardening skills! Kellie Garcia, BSc, PAg; works to facilitate more consistent approaches to water management in the Okanagan by bringing water suppliers together to share knowledge and experiences, identifying and promoting best practices, and looking at ways to integrate and streamline planning strategies and policy tools. Kellie has worked as an environmental consultant for the OBWB since 2007, and joined the staff in early 2016. Kellie enjoys gardening, biking, and spending time outdoors with her husband and two young sons. Pat Field has been working on the watermilfoil control crew since the early 1990s: building and rebuilding the harvesters and rotovators, trucking the machines to different lakes in the Okanagan, and running equipment. Both Pat and Ian are commercially certified scuba divers, and have been required to dive extensively as part of the watermilfoil control program. Pat spends his summer vacation fishing for salmon off Port Hardy. He likes to enjoy life and always eats dessert.